So it’s the start of my recipe challenge and first up are Jamie Olivers chocolate brownies (Cook with Jamie – Fifteen Chocolate Brownies). Mission is to make sugar free, wheat free, dairy free chocolate brownies. So no small challenge there! 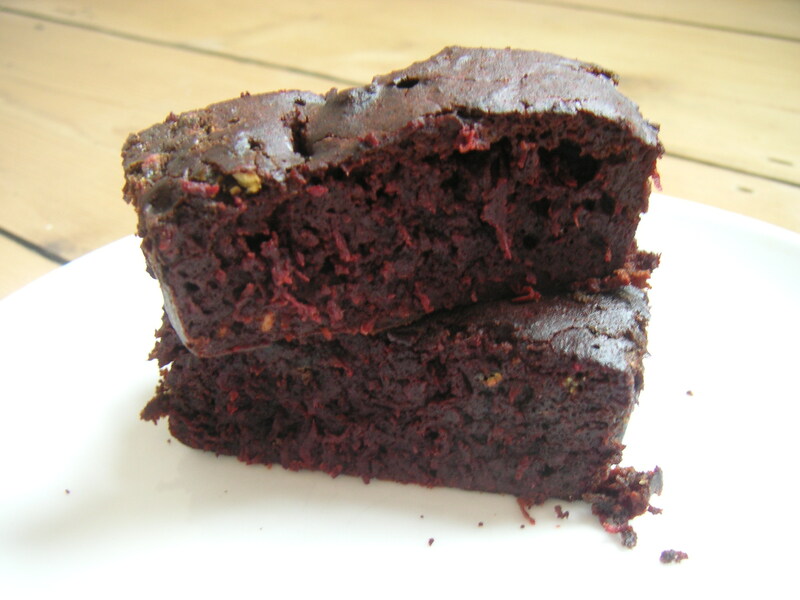 I have also wanted to try chocolate and beetroot cake for a while, so I thought why not combine the two recipes and make chocolate brownies with a twist…. Preheat oven to 180oC/350oF/gas4. Line a small deep baking tray (6inch length) with baking paper. In a pan gently melt the soya until smooth. Mix in the grated beetroot to combine. In a seperate bowl sift together the cocoa, flour and baking powder. Add this to the soya mixture and stir well. Beat the eggs and mix into the rest of the ingredients until you have a silky consistency. Put mixture into the tray and bake in oven for around 20mins. Unlike cakes you don’t want a skewer to come out clean. Once ready the brownies should be slightly springy on outside but gooey in the middle. Allow to cool and cut in to squares to serve. How easy… Firstly a doddle to make and ingredients are store cupboard essentials. Taste The texture is pretty perfect and now the cacoa is removed the chocolate taste is not as bitter. I served mine with a dollop of goats yogurt with some fresh mint finely copped, also great with a handful of berries. Cook again The second attempt at this recipe challenge has nailed – tastes like a proper brownie and the texture will be perfect for other sugar free cake recipes. 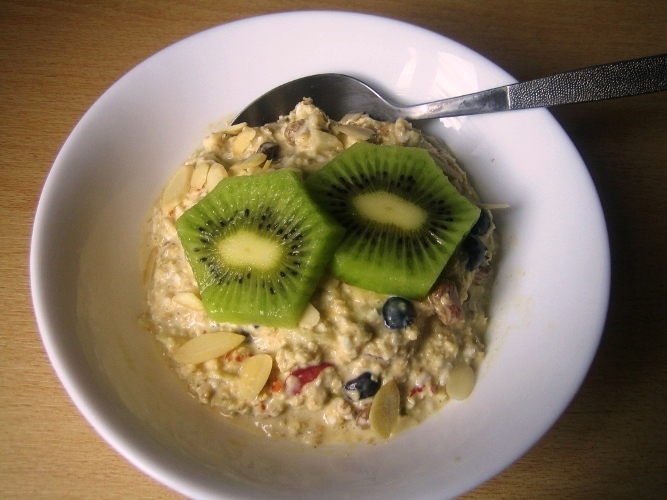 Thanks for all comments recipe has now been updated and trialled (2nd February 2009). Hope you all enjoy the chocolate sugar free brownies and let us know how you get on. Good suggestions.. had a slice last night very small one with some tinned peaches (sugar free ones) tasted good with these. So maybe a small amount of fruit juice to the mix? WOW! my brother surprised me yesterday by making these brownies. he scoured the supermarket for all the right ingredients then got to work – I was very touched. anyway, they were INCREDIBLE! he left out the coconut and also the cacao, and the taste was so good. there was no bitterness and the texture was perfect. I’ve kept it in the fridge so it’s nice and chilled. I’ve just had some with a dollop of goats yogurt and a few strawberries and it was really good. I’m so excited, I think I’ll be diving back in quite soon for some more. Thanks to Claire’s bro for getting our sugar free brownies down to a fine art! 1) Is the beet cooked or raw when added to the batter? I ask because I made a beet chocolate cake recently (not your recipe) and it came out awful. It was so bitter and earthy. I had cooked the beet before adding it to the batter. I’m leery of trying again but may be willing to. 2) Can you tell me what soya spread is? Is it tofu? What are the ingredients, so I can try to find a comparable product in CA? The beetroot is raw in the recipe. I think beetroot cake is an acquired taste. When you prepare the beetroot peel and then wash them before you grate them as this can help make them taste a little earthy. Have you got any food intolerances? As this recipe can be tweaked to be even tastier if you can have things that I can’t. Let me know and I can give you some more tips. Hi Miranda, thanks for the response and the tips on using the beets. Now I see that soya spread is basically a butter replacement, I can probably also clarify some butter. Dairy is my main food intolerance (milk protein specifically, includes all animal dairy). I don’t worry about the minor intolerances because I feel the stress of avoiding those things causes more damage to my health than the immune reactions taking place because of them. I do well to avoid wheat but can eat it in moderation. I like to use barley, rye, & oat flour sometimes as a replacement for wheat flour. So that would be really nice if you have some other tasty tips for me. I don’t mind adding in some sugar/honey/palm sugar/stevia either, but I like to cut the amounts down from what recipes often call far. I’m one of those people who although not diabetic, could be one day if I’m not careful. I think I will check out your dairy free section of the site. well I tried these brownies out especially for my Dad, as he is diabetic, and wanted to bake them for him. Our verdict was that they are the worst thing we have ever tasted, and actually made me feel a little ill. My partner said they have the texture of coir, topped with wet sand. Even the sugar free chocolate spread was awful, and I have a magimix food processor so thought that would work out better too. My Dad said he will do without chocolate cake, but loves the granola bar on this website, that was a hit! Hello Ali fantastic news with the granola bar, thats a favorite of mine too. Sorry about the cake its not for everyone as it is very bitter and tries to tackle excluding lots of foods normally used in baking, so if you are looking for something that tastes like a chocolate cake then not suprised this dissapointed. Does your dad have other food issues on top of sugar, and I assume he can use agave nectar? Now these are one of my favourite things to bake – Chocolate Muffins, these are also gluten and egg free, so assuming he can eat these with some tweaks they could taste even better. thanks Miranda, sorry for being so honest with my feedback. would be a bit boring if we all liked the same foods hey. this is absolutely delicious – thanks v much for posting recipe – i added veg glycerine. I made these but for me, they tasted too powdery, and needed to be sweeter. I used dairy free sunflower spread instead as I can’t have soya. I’ve done them again, and this time I put the coconut back in and used a ripe mashed banana, and added ground almonds too….